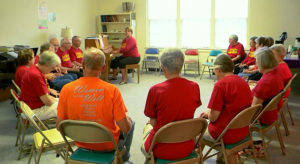 A concert scheduled for this weekend in Ames will showcase the talents of people with Parkinson’s disease who’ve found singing serves as a form of therapy. Elizabeth Stegemöller, an assistant professor of kinesiology at Iowa State University, has been researching how singing benefits those suffering with the disease. “Singing did significantly improve muscle activity associated with swallowing and also improved respiratory control, which is pretty phenomenal,” Stegemöller said. Complications of swallowing is one the main causes of death for people with Parkinson’s disease. Stegemöller has also found singing has improved her clients overall quality of life. “They’re smiling, they’re happy, and less stressed,” Stegemöller said. Jackie Manatt, who was diagnosed with Parkinson’s 13 years ago, is in one of Stegemöller’s classes. She’s found singing helps her project, as voice loss and difficulty speaking are common with Parkinson’s patients. “I just keep thinking I would probably have even less volume by now if I hadn’t taken this singing class,” Manatt said. In addition to Ames, Stegemöller hosts singing classes in Waverly, Des Moines, and Storm Lake. Some students from those classes will be featured in the concert scheduled for this Saturday (August 12) at 6:30 p.m. at the First Baptist Church of Ames (200 Lynn Ave.). Results of Stegemöller’s initial studies are published in the journals Disability and Rehabilitation and Complementary Therapies in Medicine. Her current research is funded through a GRAMMY Foundation grant.